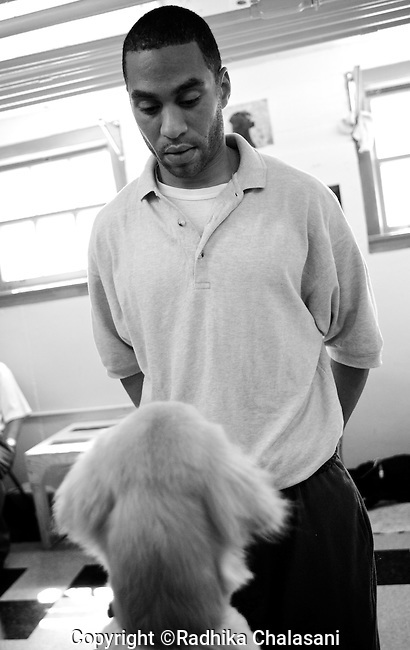 BEACON, NEW YORK: Charlie, in prison for manslaughter, works with a 5-month-old puppy also named Charlie to get him to learn to obey a sit command in the Puppies Behind Bars Program at Fishkill Correctional Facility. Charlie says the program has helped him give back to society and taught him patience and responsibility. The puppies arrive at 8 weeks-old and remain at the prisons, mostly working with one inmate, for approximately 20 months. Fishkill Correctional Facility is a medium security prison in New York with 22 men in the puppy program.